The Sept Wolves e juice flavor is a wonderful, mild tobacco flavor that is a refreshing addition to any e-liquid collection. It was modeled after a popular euro brand of cigarettes but has become a popular flavor all over the world. Pick up a bottle of Logic Smoke Sept Wolves E-liquid and enjoy. The 30ml bottle is a convenient and economical size for purchasing in quantity. Experiment and decide what is best for you. 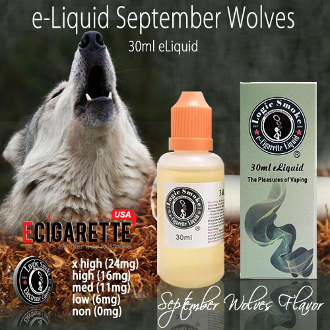 You'll truly enjoy the mild taste of the Logic Smoke Sept Wolves e-liquid. Happy vaping!